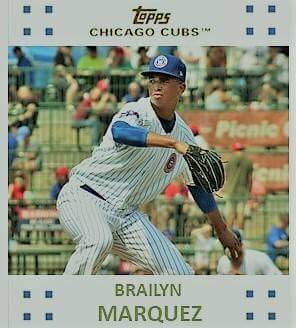 Over the past eight months, no pitching prospect has risen faster in the Cubs’ system than Brailyn Marquez. The 6‘5“ left-hander has come from the back of the pack to be one of the top 5 prospects in the system in a short amount of time. 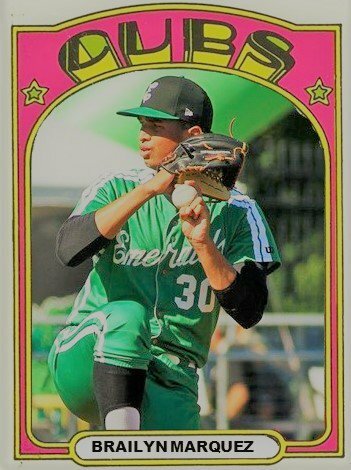 Last year, Marquez pitched at short season Eugene for most of the year before getting in two starts at South Bend. Currently, he is projected to start 2019 at A+ Myrtle Beach. He could begin the year at South Bend, but he probably would not be there long. That’s a bit of a jump to go from short season to the Carolina League with just a cup of coffee at South Bend. But when you watch Marquez pitch, it doesn’t seem like much of a jump. At just 19 years old, soon to be 20, he looks like he could be something that the Cubs don’t have in their system. And that is a high end starter. Here are five things to remember and to be cautious about Marquez. 1. Tool Kit – He has a fastball that he can sit at 94 to 97 without extreme effort. A few times he did top out at 98, but that was the exception rather than the norm. 2. Wipe Out – He has this slurvey breaking ball that slides across the plate. He gets a lot of movement from left to right and up to down. It is a pitch that just devastates left-handers. 3. Working Counts – Marquez showed a lot of growth last year in his efficiency. Early in the year, he worked a lot of deep counts and rarely made it past the third or fourth inning. By the end of the year, he could work into the fifth or sixth earnings, hence why his stock shot up. The velocity shooting above 95 didn’t hurt either. 4. Game Experience – The more he pitches, the better he’s going to be. Marquez looks like he is learning on the mound. He doesn’t look scared, but you can tell these are new situations and he is learning how to adapt to them on a game-by-game basis. 5. Time – This is a tricky concept for Marquez. Here is a guy who is very young with some plus pitches and he could move very quickly. If he comes out dealing in Myrtle Beach, I wonder if the Cubs are just going to let him sit and dominate all year, or would they put him at AA at the age of 20. It’s an interesting conundrum. You want to challenge him and, at the same time, get him experience. There are no sure things in baseball when it comes to prospects. You never know what will happen. But it’s going to be exciting watching what Marquez will do this year. Marquez might be the prospect everyone wants to see just based on radar gun readings. While those are nice, I like to see more of his ability to go deep into a game without using a large amount of pitches. He has pitches he can get guys out, some are of the swinging variety and other pitches hitters just watch because they just cannot hit it.